Apply now to attend the 2019 Fluids and Health Conference in Corsica! Applications are now being accepted for current students, alumni, and researchers interested in attending the inaugural 2019 Fluids and Health Conference in Corsica, France! 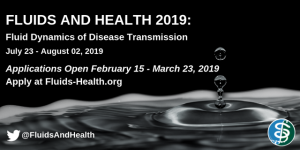 From July 23-August 2, 2019, join experts from a range of fields working to address the challenges of widespread infectious disease and food shortage. Phase 1 of selection process runs until March 23, 2019. Go to http://fluids-health.mit.edu/apply and submit your application today.